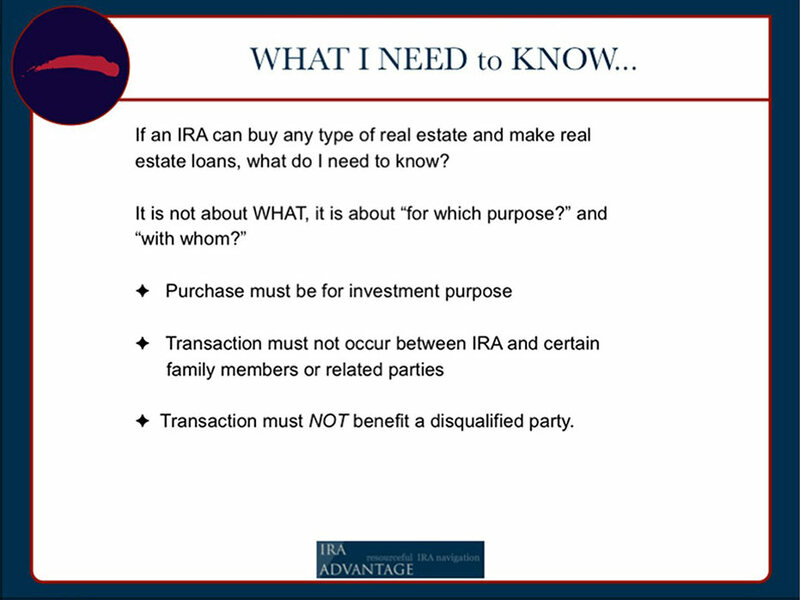 If a self-directed IRA can buy any type of real estate and make real estate loans, what do you need to know? Watch as owner of IRA Advantage, David Moore answers this question and more! So when you’re looking at these things it’s rarely an investment. It’s what the purpose of the investment is that’s going to get the profit or the opportunity. You’ve got to look at it and say okay, I’ve got this today; I want to go do this with it. If you’re going to buy a property and you want to put a disqualified party in it, or have a disqualified party work on it, or a disqualified party guarantee a loan, those situations are all problems. Sweat equity is not okay. You’re not supposed to go out and paint the property with your retirement account owns. Now you might ask how you get caught. You get caught because you get audited and somebody who knows what they’re doing is going down the ledger and they say, okay $500 to Sherwin Williams, I don’t see a ledger entry for the labor; who did the labor? Your answer is going to be the tenant. They’re going to smile at you probably. Do you have the ability of managing your asset at an expense, at a cost? No, not at a cost. It could be the argument that there should be a cost because you say okay, I just told you sweat equity is not okay. So, if you’re managing the thing I should get a fee. To that we are going to say “We don’t ever wanna see any transaction between you and that account, either direction.”But if the entity or the account owns the asset you’re employed by, then the entity is a manager of that asset. You’re not employed by it so you can’t work for it. And therefore you can’t take compensation for that entity. If you were doing a rollover business start-up then you literally have a business that’s owned by the retirement account. If you said, “hey I wanna go flip properties for a living”, you’ve probably heard people with ads doing that. If that’s what you want to do for a living, and you wanna go work on the properties then we are going to create a 401K plan. We’ll create a c-corp form the plan and that buys the corporation. We typically will have our client be an owner of that corporation as well maybe 5% of it. So the money is going to flow from the IRA or the 401K plan, wherever it is today, into the new plan. Then we create the corp, the plan buys the corp, the corp then makes the investment and you’re able to be employed by that corporation, take salary, and do whatever you want. Now understand that whatever the corporation owns, and we’re talking C Corp, anybody remember measure 97? You’ve got situations where you’ve got taxation, double taxation potentially in the use of C Corp. So understand more often than not unless that corporation’s going up in value, that plan is providing the financing or your ability to do your business, but it’s probably not growing up in value a whole bunch. It will take time, but that plan can also make any investment blow out, so not all the money has to go in the corporation. That plan can be used to make other investments independently with the corporation. Why would you put it in as c corporation? It gets double taxes as opposed to an LLC that floats through the plan. Because it doesn’t work with an LLC. Basically if you look online type in; Robs Rollover Business Start-up, and look at the failings, why these things have failed. Typically, it’s because somebody’s used and IRA, which you can’t do. Or an LLC, which you can’t do either. Or any combination of those things, which once again… you cannot do. The other issue that you’ll see come up is when we’re putting these together. For example, I had a guy who came to us because he wanted to buy a car dealership. He’d been a dealership general manager for years, had always dreamed of owning his own company and he had never been given that opportunity. So for him, when he finally had enough money in his retirement account to go buy a car dealership he didn’t want anyone else to own that thing. Right? What typically happens depending on that person’s position and whether they want it or not is you’re going to make that investment easy or unattractive. You’ve got restrictions to entry into it. If you’re buying a business that’s already going then you’ve got more issues to deal with because you’re taking over an existing plan and other things coming into play. If it’s a brand new business, and brand new plan you can probably get it into a place that might allow it. But, back to your question it has to be a C Corp and it has to be a 401K. Just because. So if we’re talking about borrowing from your IRA then you can’t do it. But if you’re talking about using your IRA to pay off something, I just told you there’s a way to do it but typically it would not be looked at as a good transaction to take retirement money to pay off a property you’ve got or any of those type’s of scenarios. Going out and buying new things, that’s fine. But you have to be careful any time you’re transacting with anyone that could be considered a disqualified party. That’s where your issues are going to typically be. What happens once again with a check book IRA for example is that people have the opportunity to do their own thing. Let’s say you want to make a contribution and instead of running that contribution through the custodian, every transaction should flow through from the investor through the custodian to that check book IRA account. We’ll talk about structure more in a few minutes, but everything has to flow through the custodian. Inevitably people make a contribution directly to the LLC or they take a distribution straight from the LLC account. Either one of those transactions is a prohibited transaction. And as I said a prohibited transaction is very problematic with an IRA. Some of the custodians have put in a correction vehicle, an IRA contribution distribution correction they put in place to try and clean up the bookkeeping on what’s happened there.